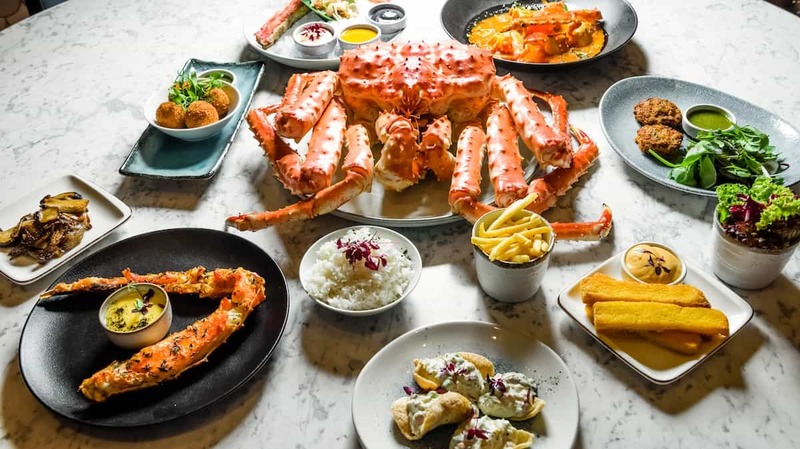 Touted as “the only place to eat Red King crab in London”, Fancy Crab specialises in the most prized of three traditionally Alaskan king crab varieties. Fished from the cold waters of the Barents Sea off the coast of Norway and Russia, the restaurant receives the crab directly from their supplier to ensure peak quality, our waiter, Castro, explains. Red king crab fishing is a dangerous, gruelling business. Usually carried out between October and January, the process has an alarming fatality rate – with an average of one fisherman dying each week during the season. Red King crab is also particularly rare, with the 2010 having yielded only 11 million kilograms, compared to 91 million in 1980. As a result, the fishing is governed by a number of strict policies. Specific size requirements must be met, and only certain types are legal at different times throughout the year. Once caught, only males may be kept, leaving the female crabs to reproduce again. The crabs are then stored live in a holding tank until the boat reaches shore, though issues such as weather, cannibalistic tendencies and the rocking of the boat can cause additional problems. If one crab dies in the hold, toxins are released which can kill others or taint the flavour of the overall catch. It’s, thus, perhaps unsurprising that the luxurious delicacy comes with such a high price tag. Occupying a large site on Wigmore Street, just behind Selfridges, Fancy Crab strikes a commendable balance of elegance and comfort. 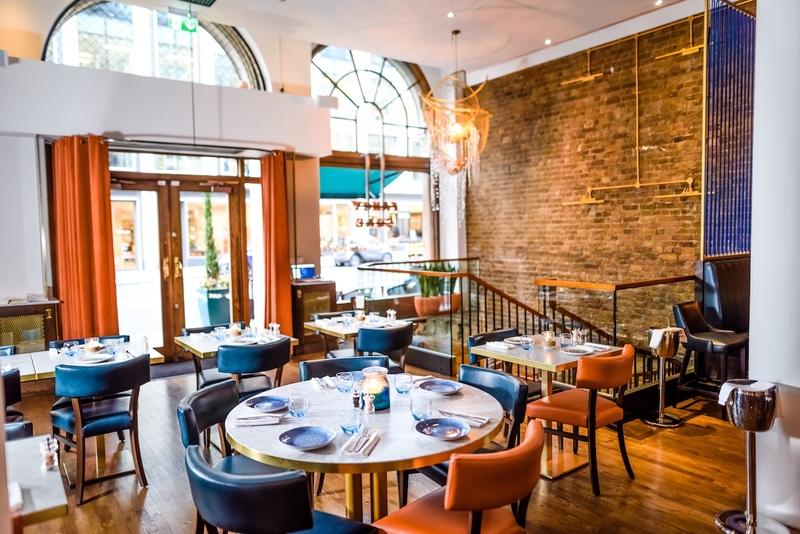 Exposed brickwork is matched with hardwood floors, marble table tops, plush booths that run along each wall, and leather chairs with a colour scheme of sea blue and scorched orange. A large red king crab mural covers one wall, joined by playful contemporary art prints also featuring the star catch. At the back of the room, a 3.2-kilogram crab dominates an ice bar. In keeping with the comfortable dining room, the service at Fancy Crab is abundantly friendly and engaging, with staff keen to discuss the produce as well as making considered menu recommendations. Alongside crab, additional treats from the sea are available on the a la carte menu, as well as various burgers, grilled chicken and a steak. To order a steak at Fancy Crab, however, would be like choosing gravy over liquor in an East-End pie and mash shop: an inexcusable error. Our dinner begins with two plump, deftly seared scallops (£11). Alone the molluscs with their golden, lightly caramelised interior and soft core are fine, but they’re propelled further by lardons of smoked pancetta, silky celeriac puree and batons of apple acting as a palate cleanser. A trio of grilled Tiger prawns (£12) are also well-cooked yet lashed with a glaze of honey and tamarind that’s cloying and saccharine, like a Pizza Hut salad dressing. The evening’s first taste of King crab – white claw meat is cloaked with dense tempura batter which almost manages to overpower the sweet crab meat concealed (£12.50). On the side, saffron aioli is an unexpected delight. We hold onto it, to be enjoyed with mains. Dinner’s key highlight is a showcase of red king crab leg (£18 per 100g): 500 grams prepared in different ways, with significantly conflicting results. Served over ice, with the shell helpfully cracked, the cold merus (the part of the leg closest to the body) is prepared without unnecessary flummery, fortunately allowing the intense flavour of the luxurious crab to prevail. Claws baked over charcoal with butter and thyme are also enjoyable, with slightly firmer meat and a pleasant smokiness to accompany. 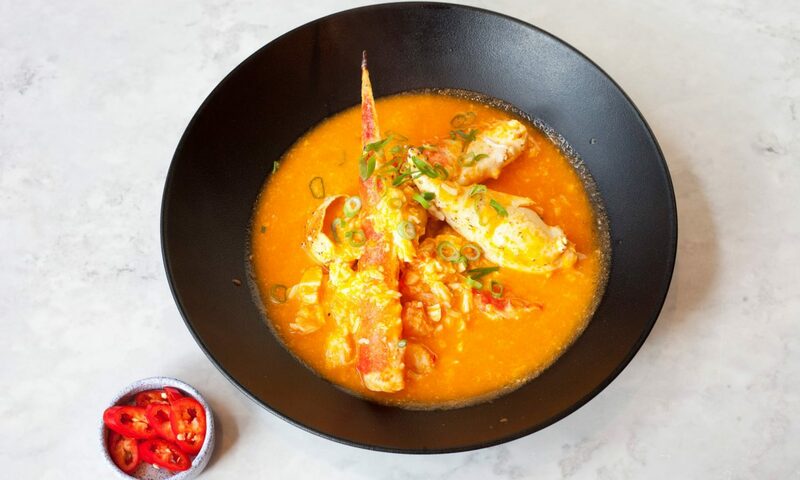 Moreover, Fancy Crab’s Singapore chilli crab (£28) features a generous portion of crab meat which lulls in a pool of curry sauce, rich with cream and tomato and lightly spiced not to overpower the key component. Desserts are similarly simple, besides the cheesecake designed to visually evoke a Red King crab leg. Panna cotta, on the other hand, is rife with vanilla, well set and paired with a sweet poached peach. In a similar vein to Beast or Burger & Lobster, Fancy Crab applies particular focus to a lavish ingredient, yet does it well. Yes, dinner is expensive, but it’s reflected in the base cost of one of the ocean’s most prized crustaceans. Fancy Crab can be found at 92 Wigmore Street, London, W1U 3RD.